Penny Candy Books, 9780998799988, 40pp. 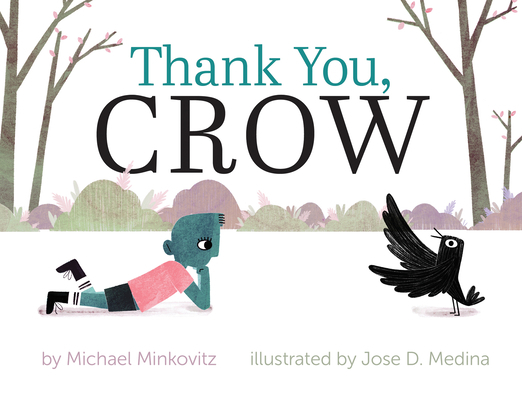 In Thank You, Crow by Michael Minkovitz with illustrations by Jose Medina, Crow brings strange treasures to Sebastian, who helped when Crow had a broken wing. With each new gift, Sebastian says, "Thank you," even though he's unsure about the gifts...until he sees where Crow's imagination can take them. Michael Minkovitz is a Georgia native who gained a unique perspective growing up in the only Jewish family in a tiny, rural community before later ending up at New York University's Tisch School, where he graduated with a degree in filmmaking. He later graduated from the Savannah College of Art and Design with a Master's degree in film, but he also had fun being a news photographer and an SAT tutor along the way, not to mention ultimately taking the helm of his family's business. Writing has forever been a passion and through-line in his life, and he is overjoyed to create and publish his first book with his husband, Jose. He lives in San Francisco, California. Jose Medina is an illustrator from Venezuela. After beginning his art education in Caracas, he finished his illustration degree at the Savannah College of Art and Design in 2017. His art addresses complex ideas in a way that is simple and engaging, focusing on social and political activism while incorporating humor and lightheartedness. According to Jose, "I can't sit back and make pictures that don't do anything; my work helps me address the world." Thank You, Crow is Jose's first book, and he was thrilled to work on it with his husband, Michael. He lives in San Francisco.